Tour de Yorkshire 2019 is coming to Barnsley! On 3 May 2019, cyclists will set off from Barnsley Town Hall. We are holding a fun day at our Barnsley Office on Church Street to celebrate and support the cyclists as they pass through the town as part of Tour de Yorkshire 2019. There will be free games and prizes for all of the family to enjoy. There will also be refreshments and plenty of cake! 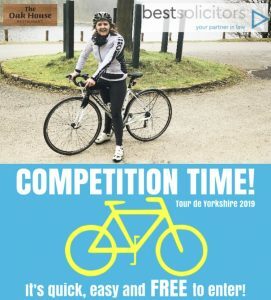 Our Managing Partner, Donna Tilbrook, is going to cycle from our Sheffield office to our Barnsley office on 3 May 2019, setting off at 10am.